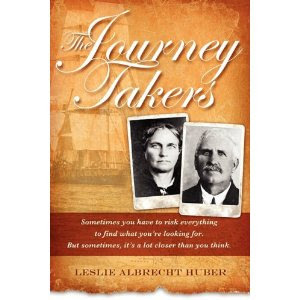 Leslie Albrecht Huber has the talent for making history come alive. Her non-fiction book The Journey Takers is definitely not a dry account of her ancestors but an appealing narrative that blends her own life with that of her past relatives, making this book feel like a novel. It was a real pleasure to read, the pages turning quickly as I was transported into the arduous, interesting, and exciting lives of common people who became immigrants and started a new life in a strange and hard land. It made me stop and think of my own ancestors and parents. The book is fascinating because it is filled with facts about the time period and country of the people she wrote about. I learned many new things reading it, among them what tedious and hard work the study of genealogy is! Meticulously researched and well written, this book includes extensive notes, family sheets and a bibliography at the end of the book, which I consulted as I read. It aroused in me a healthy curiosity about researching my own ancestors. I understood the author’s ardent desire to know more about her ancestors because I feel the same way when I visit my aunts in Italy and ask them to tell me about my grandparents and great-grandparents. But more than just details about her ancestors, Huber’s accounts touched me, especially that of Eliza Barret. I loved the author’s imagination as her mind could reel back in time and she could picture with her researcher’s eye scenes in the lives of her ancestors and what possible decisions their personal conditions led them to make. She traced her roots by travelling to the places where they were born, and walked the streets they once did. By the end of the book, I felt like I also knew these people personally. No doubt about it, the author has created and left a beautiful legacy to her children: the story of their ancestors with the clear message that family and faith are the most important things in a person’s life. Disclosure: Thank you to the author for sending me this book for review. The opinion of this book stated herein is my own, and I was not told how to rate or review this product. Your review is excellent. I am particularly interested in the ancestor research as Wayne and I have tentatively begun a genealogy tree of our own. The past never ceases to interest and amaze me. Thanks, Sandra. I agree with you that the past is interesting especially when we go digging to learn more about our ancestors. This book showed me how much work genealogy really entails. If only we could travel back in time! I love immigrant stories so this sounds interesting to me. My own grandparents immigrated to the US and I would love to know more about their background, but I have no idea how to go about researching it.